Animal Assisted Therapy for Post Traumatic Stress Disorder (PTSD) | Crockett Foundation - Tag In & Help Out! When I was growing up my family would take special trips to go horseback riding, maybe a couple times each summer. In college I even took a horseback riding class for physical education credit (fantastic). I never realized it’s possible to have the kind of relationship with a horse where they’ll lay down on the ground and cuddle with you. Just for kicks, I’m sharing this video with you. “Nap Partner” video of horse and human on grass. In terms of animal therapy, I’ve heard of Universities bringing in Therapy Dogs and their handlers to provide fun, loving relief to stressed-out college students during exam season. And I’ve heard of therapeutic time spent with horses out on ranches. Animal Assisted Therapy (AAT) or ‘animal therapy’ is not restricted, or linked, to certain types of counseling and therapy. It can be offered by social workers and other healthcare professionals. The therapist is trained in human animal interactions and they facilitate interactions between the animal and their client within the scope of their usual therapeutic area of expertise. The animal serves as a companion or a facilitator of the socialization there. The relationship between the therapy animal and the therapist may model a healthy relationship in the eyes of the client observing how the therapist interacts with the animal. By watching how a therapist and animal respond to one another, a client may see how good relationships are formed. That can help the client learn to feel safer in the private session with the therapist, and may also serve as a soothing conversation piece to build rapport with the therapist. With therapy animals, the positive benefit of physical touch has been returned to counseling. Understandably, touch has been removed from therapy in many circumstances, but there’s a cost that can be reversed by bringing touch back with animal therapy. It’s been found that after 20 minutes with a therapy dog we humans experience a significant drop in stress levels of hormones such as cortisol, adrenaline and aldosterone and we enjoy an increase in more socially inspiring / healthy hormones such as oxytocin, dopamine and endorphins. In some cases, horse therapy doesn’t include the person actually getting on the horse. LEARNING THER SKILLS ASSOCIATED WITH CARING FOR A HORSE HELP TO ENHANCE THE PATIENT’S SELF-CONFIDENCE IN THEIR OWN ABILITY TO MASTER NEW TASKS AND INTERESTS. The benefit is a higher, healthier self-esteem. The innocent trial and error of learning to communicate successfully with a large animal is a gentle way to gain confidence in one’s own value in a relationship. It can help replace feelings of helplessness in a person struggling with interpersonal relationships. “Self-Awareness: Riding helps participants to develop a more realistic view of themselves through awareness of their size in relation to the horse. This is especially important in treating patients with eating disorders as well as those with interpersonal aggression problems. One way that animals can serve Veterans struggling with mental health is simply by demanding care. In some therapy sessions – particularly visiting a ranch, for example – the animals will depend on the Veteran for food, for their grooming, and sometimes for their exercise. When Veterans with PTSD learn about equine psychology they can explore human dynamics they currently face themselves. For example, a herd-bound horse exhibits emotional distress by being separated from its buddy horse. And, for example, the experience of physically moving a horse towards or away from themselves can enhance trust and understanding of another strong, respected being who is not completely independent of others. Animal therapy makes for good, healthy introspection or conversation for the Veteran to learn about their own emotions while they attempt to grow in relationships with others. To learn about Service Dogs and how they differ from Therapy Dogs see this article. 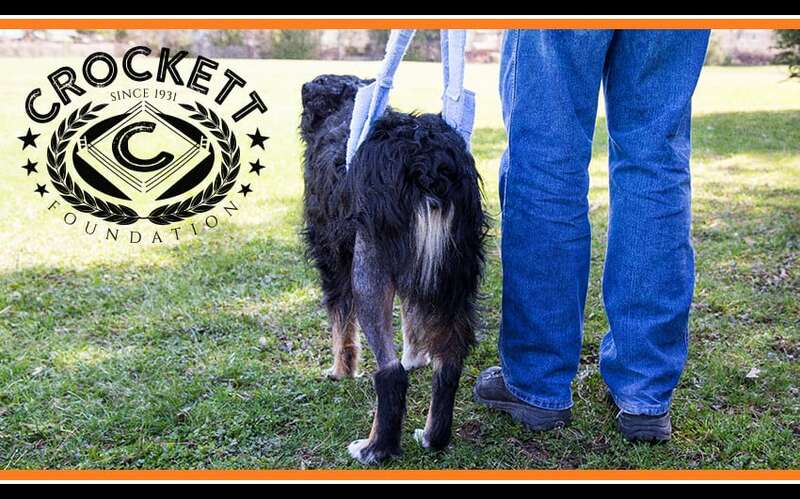 You may donate to the Crockett Foundation Veterans charity and help cover the costs to train Certified Service Dogs for Veterans in need.